Product #46072 | SKU G9XIIBK | 0.0 (no ratings yet) Thanks for your rating! 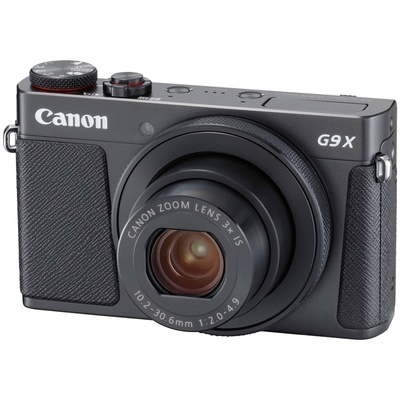 A sleek, pocketable, and quite capable camera, the black PowerShot G9 X Mark II from Canon mixes a compact form factor with advanced imaging capabilities. Pairing a 20.1MP 1" CMOS sensor with a DIGIC 7 image processor, this combination produces clean, high-resolution image quality well-suited to working in difficult lighting conditions, with extended sensitivity to ISO 12800, and also avails quick shooting performance up to 8.2 fps for working with moving subjects. Full HD 1080p video recording is also supported, as well as in-camera time-lapse movies for producing dynamic moving image content. Complementing the imaging capabilities is a versatile 3x optical zoom lens, which covers a wide-angle to portrait-length 28-84mm equivalent focal length range, and Dynamic IS benefits this reach by minimising the appearance of camera shake. The slim camera body also features a 3.0" touchscreen LCD for intuitive control as well as built-in Wi-Fi with NFC and Bluetooth for wirelessly transferring imagery and remotely controlling the camera from a mobile device. The versatile 3x optical zoom lens covers a wide-angle to portrait-length 28-84mm equivalent focal length range, and features an f/2-4.9 maximum aperture along with Intelligent IS and Dual Sensing IS image stabilisation technologies to benefit handheld shooting in difficult lighting conditions. Additionally, Dynamic IS can also be used to help stabilise videos and minimise the appearance of shake when recording while walking. In-camera raw conversion lets you apply a range of creative adjustments to your raw files, such as Auto Light Optimiser and Picture Style adjustments, and then export them as edited JPEGs directly from the camera.